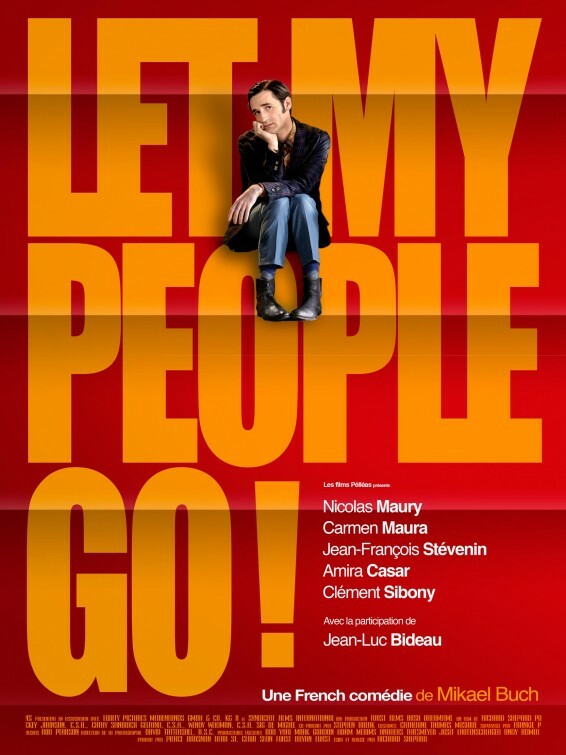 Mikael Buch’s Let My People Go!, which is now showing in New York and opening in Los Angeles on January 18th prior to a national rollout, is surely the world’s first Gay-French-Jewish-Finnish movie. Throw in Almodovar regular Carmen Maura (Women on the Verge of a Nervous Breakdown, Volver) for a bit of Spanish flavor, and this enjoyably campy comedy becomes even more international/universal. Sweet but high-strung Reuben (Nicolas Maury) is a French-Jewish postman living idyllically in Finland with his Nordic boyfriend, Teemu (Jarkko Niemi). They met there while Reuben was earning his Master’s in “Comparative Sauna Studies.” The couple’s bliss is shattered one day when Reuben finds himself inexplicably gifted with nearly $200,000 in cash. Teemu, believing the money to be stolen, kicks Reuben out on the eve of Passover, so Reuben returns to his dysfunctional family in Paris for the holiday. Back in Paris, Reuben has no luck finding solace from his philandering father, deluded mother (Maura, playing French and Jewish convincingly), abused sister or domineering brother. As he pines for Teemu and tries to recover a lost suitcase in which his small fortune is hidden, Reuben falls into one mostly-comical misadventure after another, including an unintended sexual tryst with a much older family friend. Teemu, meanwhile, learns that Reuben was telling the truth about how he got the money and heads to Paris to win his true love back. Will Teemu make it there and mend fences with Reuben in time for Passover dinner? The screenplay, co-written by Buch and fellow filmmaker Christophe Honore (Love Songs), is occasionally labored but more often witty. As an example of the latter, the film includes a moral debate over a man’s presumed death that quickly gives way to an argument over whether all French actresses are “drama queens.” It also has an early-Almodovar vibe and style to it that is only heightened by Maura’s participation. Buch moves the farcical proceedings along briskly so that, with a running time of 86 minutes, the film doesn’t overstay its welcome. I also appreciated how Let My People Go! likens the gay experiences of oppression and coming out to the history of the Jewish people as recounted in the Old Testament book of Exodus in a generally light-hearted way, including a Passover-themed “Coming Out of Egypt” dance party at a gay club. Also, Reuben refers to his suddenly Job-like life as “one big Jewish joke.” In the end, the film succinctly but potently sums up the meaning of Passover: “We’re free; We’ve suffered enough.” Now who — gay, Jewish or gay and Jewish — can argue with that?